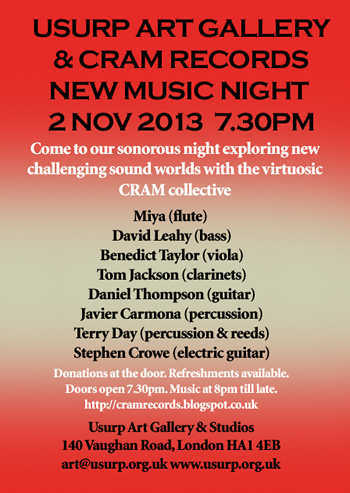 Usurp invites you to our CRAM Records night on 2nd Nov 2013 for a sonorous evening of new music. The virtuosic CRAM collective with their relentless energy, verve and imagination will be exploring new, challenging sound worlds. Donations at the door. Refreshments available. Doors open 7.30pm Music at 8pm till late. This is the first in a new series of releases from CRAM Records in collaboration with Usurp.